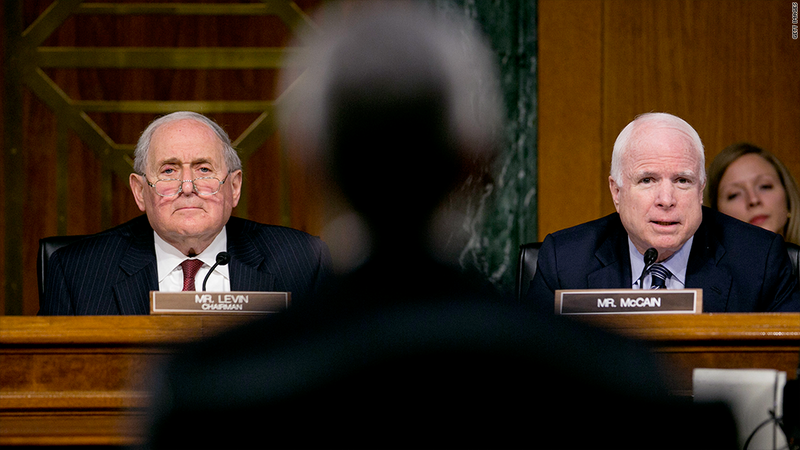 A Senate panel led by Carl Levin (left) and John McCain released a report alleging Credit Suisse helped clients hide assets from IRS and blasting officials for not acting aggressively. Bankers at Credit Suisse used cloak and dagger tactics to help wealthy American clients stash away billions in assets out of sight of the IRS, according to a Senate investigative report released Tuesday. The Swiss banking giant, which is under investigation by the U.S. Justice Department for allegedly aiding tax evasion by its rich clients, opened a special Zurich airport branch so customers could fly in, meet their private bankers and quickly hit the slopes, Senate investigators said. VIPs would use a secret elevator operated by remote control to be whisked to private banking suites. And bankers used sparse meeting rooms, avoided sending account statements and leaving paper trails, the Senate report said. Last week, CNN reported unusual ways some Credit Suisse customers moved their money. For example, one wealthy customer traveled on flights while hiding $250,000 in pantyhose wrapped around her body, according to federal court documents. According to the new Senate report, Credit Suisse held more than 22,000 accounts for U.S. customers, with assets valued at between $10 billion and $12 billion. Up to 95% of the accounts weren't reported for tax purposes to the IRS. The Senate report will be the subject of a hearing Wednesday; executives from Credit Suisse and Justice Department officials are set to testify. In a statement Wednesday, Credit Suisse acknowledged that misconduct had previously occurred at the bank. A small group of Swiss-based private bankers had violated its policies, without the knowledge of executive management. "We accept responsibility for and deeply regret these employees' actions," it said. The bank also said it had terminated the business that provided offshore banking to U.S. residents and was involved in the violations, and had cooperated with the investigations as far as it could under Swiss law. The Senate probe takes aim not only at the bankers, but also at the Justice Department. Senators claim prosecutors have moved slowly and not acted aggressively enough to get the names of account holders and the taxes they owe. The bank is the latest to come under scrutiny for business practices that U.S. authorities say illegally helped customers avoid paying billions in taxes. The government has cracked down on the practice -- in 2009 Swiss bank UBS paid $780 million to settle similar allegations. All told, 14 banks are under criminal investigation. Sen. Carl Levin, a Democrat who heads the Senate investigations panel that produced the 175-page report, criticized Justice, the bank and Swiss authorities. "After years of investigating, negotiating and jaw boning the U.S. has names for just 238 of those 22,000 Credit Suisse customers," Levin said. UBS, as part of its 2009 settlement, turned over the names of 4,700 account holders. Sen. John McCain, the top Republican on the investigations subcommittee, blasted Justice for not holding top bankers "from both ends of the Atlantic" responsible for "practices that went on for years." Credit Suisse has recently discussed paying about $800 million to settle the Justice Department probe, a figure that some officials and lawmakers think isn't nearly enough. Levin described it as "too modest" adding: "It doesn't fit the malpractice." A Justice spokeswoman said the department overall has charged 73 account holders and 35 bankers and advisers with tax evasion and related crimes, and that prosecutors "won't hesitate to indict if and when circumstances merit." She said prosecutors' work so far "has been forceful enough to cause 43,000 taxpayers to self-report and pay nearly $6 billion in taxes and penalties. Additionally, more than 100 Swiss financial institutions have applied for a program where they fully disclose their illegal conduct, cooperate and pay steep penalties."